Quality eyecare and personal attention are our focus at the office of Russell Fradkin, OD and Jane Orenstein, OD. We are a family optometry practice that prides itself on the individual care and attention we provide all of our patients. Your entire family is welcome at our office. We are located in Whitinsville on Rt 122 and our specialties include Low Vision Rehabilitation and the fitting of many types of contact lenses. 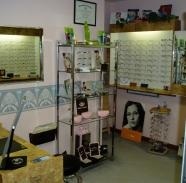 We invite you to visit our beautiful frame dispensary and choose from the latest in eyewear. We carry both affordable and high-end designer frames from Clear Vision including BCBG, Ellen Tracy, Jessica McClintock, Izod, Ocean Pacific, Puriti, and also frames by Guess, Safilo, Juicy Couture, Vera Wang, Dana Buchman, and many more! We have an optical lab on the premises to to help provide the best possible service for your eyeglass needs. Brian Girouard, R.D.O. is a master optician who will help you find the perfect glasses. We have been voted a first place in the "Reader's Choice Award" for 2014 and 2015.